Rosary Giveaway from Aquinas & More | House Unseen. Life Unscripted. Time to win, time to win, one of you will win....! (yes, sung to Jingle Bells. I tried to feel bad about busting out a Christmas carol in July, but I just couldn't muster the energy). As you may already know, the owner of Aquinas & More Catholic Goods is forced to share family reunions with my loud mouth because his wife and my husband grew up together as brother and sister. Also, they are *actually* brother and sister, so that works out well. As a perk of sharing family with me, in addition to having me laugh way too loud and wake up all the sleeping children, he also gets to let me give stuff away from his store. Yay! A whole store full of inventory that I'm not responsible for but that I can pilfer select from to give away to youuuuuuuuuuuuuu! Pretty sweet set-up, AMIRIGHT? 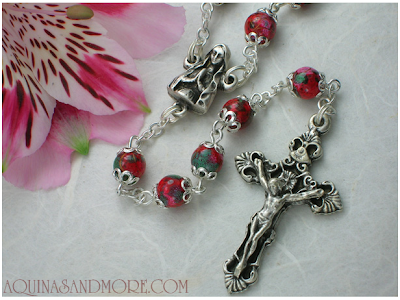 This is the Ghirelli Red Flower Design Glass Beaded Silver Plated Rosary from AquinasandMore.com. It's 22 inches long with 6mm beads and made in Italy. Fancy! Italian rosary! Silver plated! You know you want it. So enter, why don't ya? That fancy rafflecopter entry form is just waiting for your little clicky-clickies. Ohhhh pretty! I'd love to win that! Forgot to talk about the rosary. Mom brain for the win. I love saying the rosary because it leaves me with a sense of peace. I try desperately to say it daily while my newest little one naps on me. I need to pray the rosary waaaay more, so this lady's got her hand up. I can't find them on Twitter. I'll keep looking, since that's a v.v.v pretty rosary. I'm a dork! Totally needed to edit the entry form. But I just did it, so it should be good to go. Sorry. Now to leave a comment like you asked for. Doh! I love this and have not said a rosary in years. Mine is the old plastic blue one from when I was a girl. I do think that saying a rosary gives one a sense of peace and calming. I rarely said one in my home, usually at church. I think this would actually get me on the rosary bandwagon again. I would just need to find the booklet to remind me of the mysteries. Whenever I mention that we are tangentially related, people blink and then try to figure out if I'm making a joke. Then they say "But she's so funny and cool and you, well.."
Thanks for pilfering our store! When I was growing up, we said the rosary as a family every night. My mom would say the first part of the hail mary and the rest of us would finish it. My friends would join in if they were spending the night and it was just expected that after dinner we all sat down together and said the rosary. With as busy as my family is now, I would love to try to implement this at least a few days a week. I haven't tried yet though. My parents still say at least 1 rosary a day together. It is definitely a beautiful rosary and would be treasured. I love the Rosary because my frazzled mom-brain goes blank when I try to think up my own prayers! I sooo need to pray it more often. Just said one last night, a beautiful rosary for people with HIV/AIDS. It's like exercise, I grumble and avoid and procrastinate, and then wonder why I didn't just give myself the gift sooner! I think we could all afford to pray it more often. Pray without ceasing as St. Paul says. I pray the rosary at mass on Sundays...and shoot the stink-eye at all the loud folks who filter in and try to start a conversation with me. Really!!!?? Who DOES that!!?? I feel closer to Christ and his Mother when I pray the Rosary. My daughters are getting old enough to learn about the Rosary and I'd love to have a beautiful one to teach them with. I love that it is a simple way we can take something made by the hands of man to connect to heaven in a tangible way. It's an easy way for my children to join in praying as well. Love it. I love this rosary!!!! Beautiful. Such a sweet giveaway! I'm a relatively new reader (and a horrible commenter). I love when I'm in the habit of praying the rosary routinely. It's so easy to fall out of, but in college some of my fondest memories were praying the rosary with my (now) husband. Yes please. I'd love for this to be my first rosary! I would love to win this beautiful rosary. We are in the middle of a novena for my sweet brother in law, who lost his job, and then his unemployment just two days before the birth of their 4th baby. This Rosary is gorge! And, didja know that red Rosaries are the easiest Rosaries to find at the bottom of your purse/diaper bag? Just don't ask me how I know. Praying the rosary has many benefits, both personally & spiritually. Personally, it's a way to honor Jesus & His mother, Mary. Spiritually, it helps fight evil in the world today. The more people who pray the rosary, the more chance of peace in today's world. I am in the RCIA program and love praying the Rosary. I feel so connected to Mother Mary and our Lord, Jesus when doing so. I would like to pray it more. I find it has a calming effect on me. When I feel anxiety, I find that focusing on the mysteries helps me to tune out those annoying thoughts that are causing my anxiety. Haha, wouldn't it be funny if I won AGAIN? Truly the daily Rosary has been a great blessing for our family. It is a very special way of inviting Jesus and Mary to enter into daily family life. I encourage everyone to embrace this prayer that Mary gives us, that the Church recommends so much, that was so dear to the heart of our beloved Blessed John Paul II. It will bring love into your family. And funny stories too! This reminds me that I have to do another "Rosary Time!" post on my blog. What's under the silver plate? I hope it's industrial steel. If they ever decide to invent the unbreakable rosary, they should test it on my family! This is a beautiful rosary--I'd love to win it! Praying the rosary is such a calming way for me to wrap up my day, but I don't say it nearly enough. I am seriously considering returning to the Catholic Church after 22 years away, and one of the things that I have done recently was pray the rosary for the first time ever. I don't have one, and can't afford one, so I'd love to win this beautiful one! This is a beautiful Rosary. Thank you for this give away. I pray the Rosary at least one a day. When I'm home I try to say the Rosary with Mother Angelica on EWTN. 3pm is the Divine Mercy and 3:30 is the Rosary again. I also keep a Rosary in every room in our home, on the bed post, and on the night stand. I love the Rosary and I don't think you can ever have enough. Praying the Rosary is a beautiful devotion to Our Blessed Virgin Mary. I don't say it as often as I should, but it always brings me so much peace when I do. I would love to win this! If you have trouble with the rosary, especially if it seems to you like a naive kind of prayer, and you crave something deeper, please consider the words of Jesus, "Whoever humbles himself like this child is the greatest in the kingdom of heaven." (Mt 18:3). Time with the rosary is time of surrender, humility, obedience, and listening. These are as important to your spiritual growth as intellectual formation. This Rosary is beautiful...I would love to win. I hope to pray the rosary more with my children. I love our Blessed Mother so very much and I'd love to offer her my prayers on this lovely rosary for the poor souls. I pray the rosary often, it gives so much peace and solace to me. Your selection is beautiful! Good luck to all who enter. And most of all God Bless your boss that lets you pilfer errrmmmmm select the choice of the week! The Rosary is such a beautiful way to pray and meditate. I think the only question is whether I'd be able to keep the Rosary myself or if my wife or daughter would put on the big puppy dog eyes. It's a beautiful rosary! Beautiful rosary. I'd love to win it. Beautiful. I want to teach my daughter to pray the rosary. She is learning how to do the sign of the cross and understands when to say Amen. What a lovely rosary! Every morning I go for a walk and say the rosary for our Holy Mother's maternal care on our Church and our priests and bishops. It's a great way to start the day! Growing up as a triplet we would take turns to decorate a table in our room as the "Altar" for the family's rosary that night. So we would pull out lace doilies and fabric and put our statues on it, and crucifixes, etc. and of course a candle. Then after dinner dishes we would all gather in that person's room for the night to pray our rosary. Sadly as we grew older, we stopped doing it and we would only pray the rosary during Lent and Advent together. I would always keep a rosary in my pocket to pray when I as done with work in class at high school, I would also pray to her to get us safely through the day and to never be late to a class each day. Now as we are graduated from High School (I never was late) and going our separate ways for college next year, my sister and I have caught back on it. I would always pray it once a week, though sometimes more, especially when I went on walks or was done praying my office for that day. I hope since I am starting Seminary next year, our blessed Lady will watch over me and keep me safe. And that I will be able to develop the habit of praying it daily once again. Our Lady of Perpetual Help, Ora Pro Nobis. awesome! Marc just got a new rosary and I would love one as beautiful as this. I have my grandmother's but it's a bit too precious for everyday use, and my everyday one is getting grubby. My husband and I need to make a habit of saying the rosary together again! This rosary reminds me of the Sacred Heart, and I'd like to give it to my husband. Wow! Everyone had good reasons. My reson is to get closer to the Lord. I started a new and amazing journey to become closer to Jesus a few years ago. I started strong and now am at a slower place. (If that makes sense.) I have my moments when I feel sooo close and I have my moments when I feel sooo far away. The rosary reminds me that when I have that far away feeling, He is still close! Oh I forgot, I am Josh on the fancy rafflecopter thing. LOL! Oh didn't realize I am suposed to TALK about the rosary. Well I had a very favorite rosary given to me by a friend's mother when I graduated college (I converted while in college). Recently it broke and I lost a little metal ring and now can't fix it. So I have been using one of the kids' plastic rosaries. And that is a bummer. I have several rosaries here at the house. I leave them bedside in our guest rooms (empty nest) so our family can pray the rosary when they visit. Hubby and I also keep our own on our bedside tables for our own praying! Love your beautiful gift, I'd love to add it to my small collection! The Rosary is the prayer to the heart to Mary and to God. It is a comfort to me. I wear a rosary bracelet sometimes as I was given one when I was in the hospital. It is something my mother taught us along with our Catholic school upbringing to do when you need some peace to put your thoughts and prayers into the hands of Mary for she will lay it before her son. What a lovely rosary. Pick me! This is so nice of them! Congratulations on your newest addition and successful delivery. Wow, what a beautiful rosary! I wanted to buy a new one to replace my plastic one that lost its crucifix, and my other plastic one that doesn't have enough beads for a full decade somewhere in the middle, but I haven't gotten to the Catholic bookstore here yet. Would love a beauty like that one! I love the Rosary! Mary always calms me down when I come to her with a heavy heart!! This rosary is gorgeous! I'd love to have it. Congratulations on the newest little one! Trying to get closer to god! What a beautiful rosary! Most of mine have been broken by my 5 little Indians...so I'd love one that is in one piece or not taped together! I love saying the rosary with the family, and ever since discovering St. Josemaria Escriva's meditations on the mysteries, I love it even more. Is it wrong that I just want to write: gimme gimme gimme? Ok, fine. Growing up we prayed the rosary, but only since I've left home have my parents made it a part of every drive they take. They live out in the country (45 minutes from AnyWhere) and so the rosary gets prayed a lot, I am trying to make it more a part of our family's tradition now, too. And my parents are helping by lending us their minivan for the while summer (!) and leaving no less than 6 rosaries in it! Alas, when I head back to Korea, I will have only child rosaries and mine with a broken crucifix, so I'd really love a new one. Definitely need to pray it more-I love that I can pray it even when I have nothing to say. Okay, that rosary is gorgeous! I love it. Oh, so very beautiful!!! We used to pray the rosary every nigt as a family when I was growing up. There were four of us then (7 altogether - 3 ot of the house) , and we each had our own mystery we led, minus Mom or Dad. I remember being so proud of myself the first time I led by myself. Now, I pray it almost every car trip (town is 15 miles away) and we pray it as a family at least once a week. We've prayed it in good times and scarry times - and oh he cOmfort it brought during the scary times! Coming back to the church has been been difficult, and I hope to be able to start praying the rosary a lot more! I left the faith for a long time, and I firmly believe that my mother and grandmother used the Rosary as a lasso to bring me back. For a while, when I first started saying it again as an adult, I had images of the Blessed Mother holding my hand and beckoning to her Son to come closer. And he did - through the months of my re-version back to the Faith I watched Mary bring our Lord closer and closer through the Rosary until eventually, she fell to the background and Jesus became my all. She had blessed me tremendously through the Rosary! Thank you Blessed Mother!! My 18 yo daughter is leaving for her freshman year of college in 3 weeks. We homeschooled her since Kindergarten. It is such a bittersweet time and I know that this Rosary would be a lovely thing to accompany her to college. What a beautiful rosary! I'd love to be able to give it to my daughter at her first communion. I would love to win this rosary! My sister and her 4 kids have been praying the rosary at night and she just told my sisters and mom how bummed she was because all her nice rosaries have broke...4kids under 5...need I say more! Would love this for her! Well, being that I'm not Catholic, I've never prayed the rosary, but I've been assured that this shortcoming doesn't disqualify me. Nevertheless, I've always enjoyed the mass and all the trappings of Catholicism, and I've admired several folks whose lives have reflected to me all the good things about the Catholic Church. This rosary would make a great gift for one of those people. Beautiful rosary. I would love to win for my sweet mother in law, Donna. She lives in an assisted living home and always asks my girls for rosary beads (which they make with plain beads), because she gives them away to all the other residents in her home to pray with her. She started praying the rosary after her husband died a few years ago and encourages all the other Catholics at her home too. She would love this one enough to keep it for herself!!! I love praying the rosary because it makes me REALLY focus. I can't just spit out a 30 second prayer and be done with it... I have to be purposeful and pay attention. I'm going to sit this one out because my rosary from Lourdes is still hanging on (despite looking a bit worse for the wear, only 5 years later), but I just want to say I am REALLY loving everyone sharing their stories!! Especially since I didn't grow up Catholic, hearing about everyone who grew up saying them as children is so touching. If I may add my own...I really developed a love for the Blessed Mother while discerning marriage with my now-husband. I so desperately wanted to do the right thing and I was so frightened that I wasn't supposed to be with him (I was discerning religious life as well at the time), that I prayed rosary upon rosary every night, until the wee hours of the morning, just begging for guidance! I had so much to say and didn't even know where to start - so somehow I just put it all behind that simple prayer and begged the Blessed Mother to help me, woman to woman. I received such peace in those wee hours of the morning, praying the rosary, and it gave my husband and I such an incredible foundation of prayer in our relationship (he was praying the rosary too, on his side of the country). Ever since then, if it is something of utmost importance, I know that I have to pray a rosary. When it absolutely, positively, has to be answered overnight, the only person to call is my Mother!! WOW! These are some AWESOME stories and thoughts! Kind of like the treasures of our faith, no? I love the rosary and hold it very dear, and like many above, don't know WHY I haven't cultivated a more disciplined devotion to it in my regular prayer life. I have many many memories of praying it in various groups (college, mission trips, family) and always find it so powerful to pray with others. I love that it is the simplest of prayers, can be taught to a young child, yet offers the richest food for contemplation for even the most advanced in the spiritual life. It's graces cannot be exhausted! It's also a great reminder of the concrete-ness of our Catholic faith - having those beads to hold tightly is just such a great consolation, whether the soul is capable of uttering the words of prayer at that moment or not. For those who are uncertain about praying it or have never tried, go ahead and try it - an awesome and insightful exercise in prayer! God bless you Dwija, you are awesome! I am becoming an empty-nester this fall, so getting back to saying the rosary will bring me peace. This one is beautiful, so would look forward to getting one! Thank you for this offer! A lifelong Protestant-turned-Catholic, the rosary was quite creepy to me at first. Creepy, but awesome. Creepy because I never wanted to offend Jesus by "worshiping" Mary or by reciting rote prayers (both of which I'm thankful to have learned I'm not doing by prayerfully reciting the rosary). Awesome because "popcorn" and other conversational prayers have their place, but a time-tested prayer like the rosary gave some order and scope and focus to my prayer life. Clearly, the Church knows what she is doing. Praise God! Am I totally too late? I'm too late, aren't I. I hope not. Anywho; Love love this rosary, and seeing that this mama is terrible at praying it, and my beloved rosary my sis gifted to me at my conversion confirmation 3 years ago is Broke(! ), I'm also in dire need of one I can carry around and USE for goodness sake. Mother Mary, pray for us. I love just being at peace with the Lord when I say the rosary. It's so nice and peaceful! Not sure what happened with my last comment. Such a beautiful rosary! Would love to win it and give it a friend who will be starting RCIA classes this fall! Like many, I wish I said the rosary more. I love saying with my husband. I love to do rosary every day. Saying a rosary is like a meal to me. It gives me energy and sense of peace. I bought rosary beads for doing rosary so that I can concentrate on my prayer. My very first really real magazine article! So I'm Supposed to be...Nice? Winner, winner! But no chicken dinner. Sorry.